The meeting between the delegation of the Vietnamese Government Office and USAID representatives in Washington DC on April 10. He spoke highly of USAID’s increase in its budget for supporting Vietnam by 40 percent over the last three years. 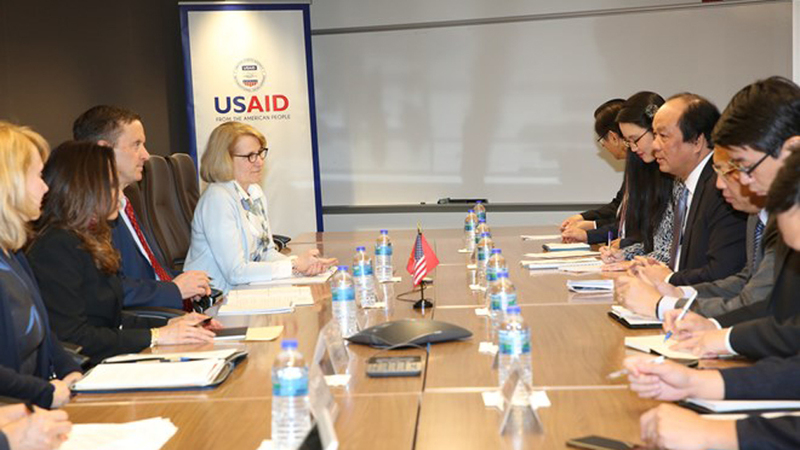 Dung expressed his belief that bilateral cooperation will continue developing through the Country Development Cooperation Strategy in Vietnam for 2020-2024, which is being built by USAID. He also asked it to keep conferring with the Vietnamese side during the strategy making the process so that this strategy can have the best assistance orientation. Bamboo Airways, the fifth airline in Vietnam, will operate its first flight on January 16, according to the carrier. (BGO) – Vice Chairwoman of the Bac Giang provincial People’s Committee (PPC) and Head of Executive Committee’s Representative Board of the provincial Bank for Social Policies (BSP) Nguyen Thi Thu Ha on December 12 paid a field trip to inspect the implementation of the preferential credit policy in Luc Nam district. She was accompanied by representatives of the PPC’s Office, BSP’s branch, the provincial Ethnic Board, People’s Committee in Luc Nam district and others. The National Action Month against HIV/AIDS 2018 was launched at a ceremony in Ho Chi Minh City on December 1 with the participation of Minister of Health Nguyen Thi Kim Tien and nearly 2,000 representatives of students, armed forces and mass organizations.